Home / Dog behaviour / Is your dog lying to other dogs about its size? Is your dog lying to other dogs about its size? Don’t mess with me! That’s the signal small dogs seem to be sending when they pee on things, according to a new study. Researchers have found that the smaller a pooch is, the higher it lifts its leg to mark lamp posts, trees, and other objects—and these exaggerated urine streams may fool other dogs into thinking a large canine is in the area. Conducting the study wasn’t easy. Betty McGuire, a behavioral ecologist at Cornell University, and her colleagues studied 45 dogs from two shelters in New York City. 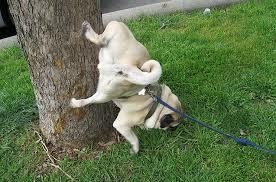 The animals, mostly mixed breeds, were all adult males, because they’re more likely to lift their legs when they pee. The researchers walked them outdoors in areas that included trees, benches, a fire hydrant, and other tempting targets, while recording from behind with an iPhone. Precisely measuring pee spots before they dried—without disrupting the dogs midstream—was a challenge. And whereas some dogs liked to mark trees and poles, others preferred tall grass, where their urine was much harder to find. Some dogs, after sniffing a spot and lifting a leg, missed their targets entirely. We spent an inordinate amount of time out there,” McGuire says. When a dog made a mark, the researchers measured its height, and then measured the angle of the dog’s raised leg from the video. In all, the team analyzed several hundred leg lifts over about 2 years. The dogs’ average urination angles, which ranged from about 85° to 147°, got more extreme as the animals got smaller, the team reports in the Journal of Zoology. Smaller dogs may hoist their legs higher in an attempt to lie about their body size. By exaggerating their own bulk, McGuire says, they could be sending a message to the other dogs: “Stay away from me!” The small dogs may hope to avoid face-to-face interactions with other animals likely to outmatch them in a fight. Still, the dogs may not be lying at all, but instead “overmarking,” says James Serpell, an ethologist at the University of Pennsylvania School of Veterinary Medicine. Dogs often like to cover up other dogs’ pee with their own, he says. Small dogs may lift their legs higher simply because they’re trying to reach a larger dog’s urine spots. Alternately, Serpell says, the explanation might be as simple as anatomy. 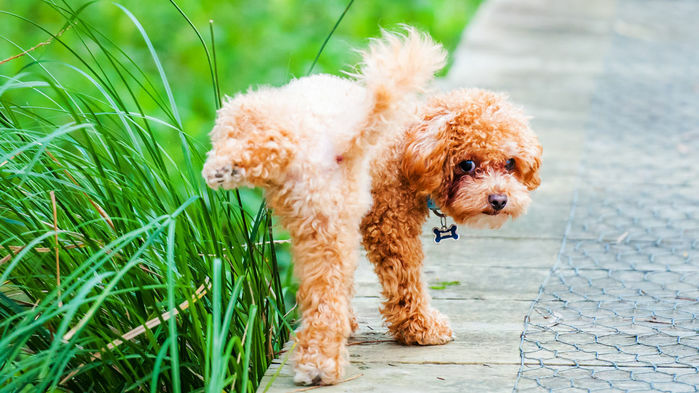 Maybe all male dogs lift their legs as high as possible to pee, but small dogs are more limber.